Tiny white flowers clustered on spikes with a strong vanilla smell. Reddish-orange, tubular flowers. Extra hardy during drought and heat. Dark orange to red, tubular flowers. Yellow flowers with pale orange centers. Fragrant, white to pinkish flowers. Ball-shaped clusters of orange flowers. .
Yellow flowers with long red stamens. Flowers with yellow petals and yellow stamens. Elaborate flowers with yellow, orange and red petals. Bright red, clustered stamens resembling miniature dusters. 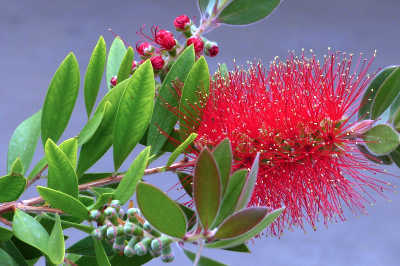 An evergreen shrub with large, red, bottlebrush flowers and lemon-scented leaves. An evergreen shrub with fragrant, white flowers, edible red fruit, and dark green leaves in overlapping clusters. An evergreen shrub covered with clusters of tiny white flowers and a strong lilac scent. A columnar cactus with large, fragrant, night-blooming flowers. The red fruits are edible. An evergreen shrub covered with fragrant, yellow, daisies. Rose-purple flowers in short spikes. An evergreen shrub showing off papery, winged seed capsules. .
Yellow flowers with orange to brown centers and sliver, blue-green leaves. An evergreen shrub with red tubular flowers. An evergreen shrub with blue tubular flowers that bloom most of the year. A winter-blooming, evergreen shrub with red tubular flowers. An evergreen shrub covered with yellow flowers in the fall. Clusters of red, tubular flowers on long stalks. A long-stemmed, green succulent with red, slipper-like bracts hiding tiny flowers. White flowers, with yellow centers, followed by feathery, pink, plumed seeds. Orange to red flowers clustered at top of very spiny, tall green canes. Narrow evergreen leaves sprouting stalks with reddish tubular flowers. Tiny, clustered, purple flowers among fragrant, lavender scented leaves. Reddish tubular flowers and blue-green, succulent-like stems. Clusters of orange, tubular flowers. Small flowers, in rounded clusters of various colors. Small purple flowers in rounded clusters. An evergreen shrub with small yellow flowers and shiny green, resinous leaves. Purple, pink or white flowers amid green to silver leaves. .
An evergreen shrub or small tree with an exotic leaf pattern and fragrant white to cream flowers. An evergreen shrub or small tree with flowers that bloom spring through fall in a choice of colors. An evergreen shrub with fragrant, clustered, purple to white tubular flowers. Extra hardy during heat, drought and freezing temperatures. A succulent shrub with small, clustered, pink flowers. Edible leaves. An evergreen shrub or small tree with holly-like leaves, edged with soft spines, producing red cherries in summer. A tree or shrub with highly ornamental flowers and fruit. Extra hardy during drought and heat. Pyracantha coccinea: Scarlet Firethorn A thorny evergreen shrub with showy white flowers and brightly colored berries. An evergreen shrub with dark green, holly-like leaves. Small red berries develop in summer. Edible, reddish berries on soft, bendable stems. A vine-like shrub. Large clusters of medium-small white or yellow roses with a slight fragrance. Blue or purple, trumpet-shaped flowers. . Vivid dark blue flowers and fragrant leaves. Fragrant, gray-green leaves and blue trumpet-shaped flowers. Red flowers attract hummingbirds and butterflies. Extra hardy during drought and heat. An evergreen shrub with clustered yellow flowers in winter and spring. An evergreen shrub for a xeric garden. An evergreen shrub or small tree producing fragrant, violet-blue flowers in drooping clusters. White seedpods persist for months. Aromatic leaves and yellow flowers with orange centers. Orange trumpet flowers and interesting patterned foliage. Yellow bell-like flowers 2" long. An evergreen shrub with blue flowers and silver-blue leaves. An evergreen shrub or small tree with clusters of small white flowers. Long, sharp and narrow, evergreen leaves producing short stalks with red buds which develop into large, yellow-white flowers. Yellow flowers with an orange eye.